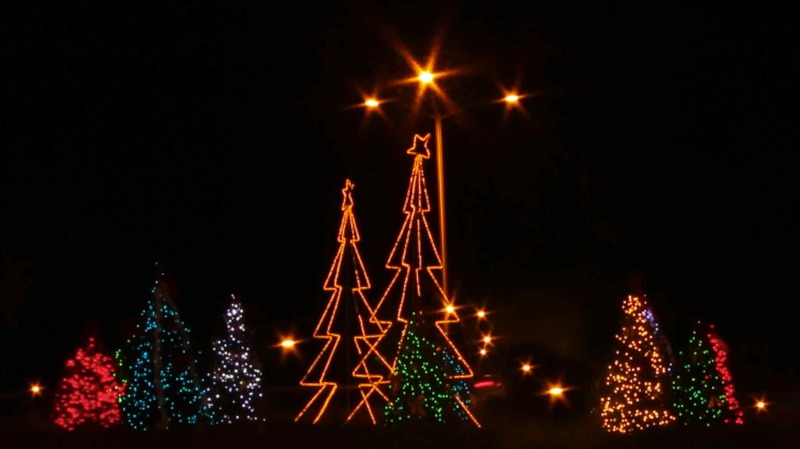 Christmas in Barbados: Round & Round We Go! The roundabouts in Barbados are dressed up for Christmas, looking like colorful confetti strewn around the 14-by-21-mile island as a welcome to all who fly in at night. 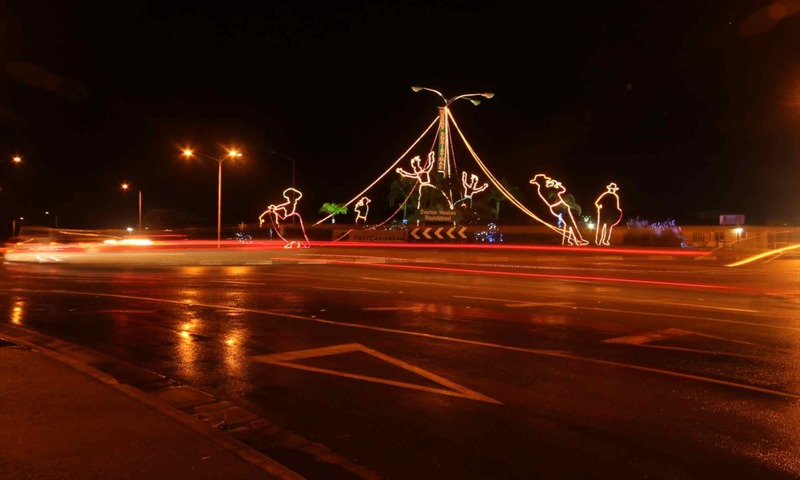 Please, come with me on a tour of a few Barbados roundabouts … I had a ball taking these photos for you last evening (and am hoping Santa will bring me a new tripod for Christmas!). The merry displays make me smile … and help assuage the frustration I still feel by being forced to drive clockwise around the circle when counterclockwise would feel so much more natural to this Yank. This is the Everton Weekes Roundabout, aka First Caribbean roundabout, with a lively tuk band celebrating Christmas 2010. Sir Everton is a famous and beloved Barbados cricketer. 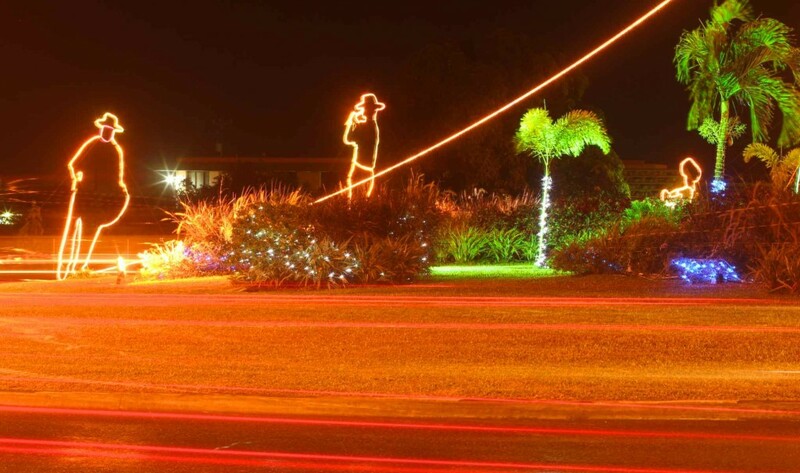 A lighted depiction of a man playing a steel pan. 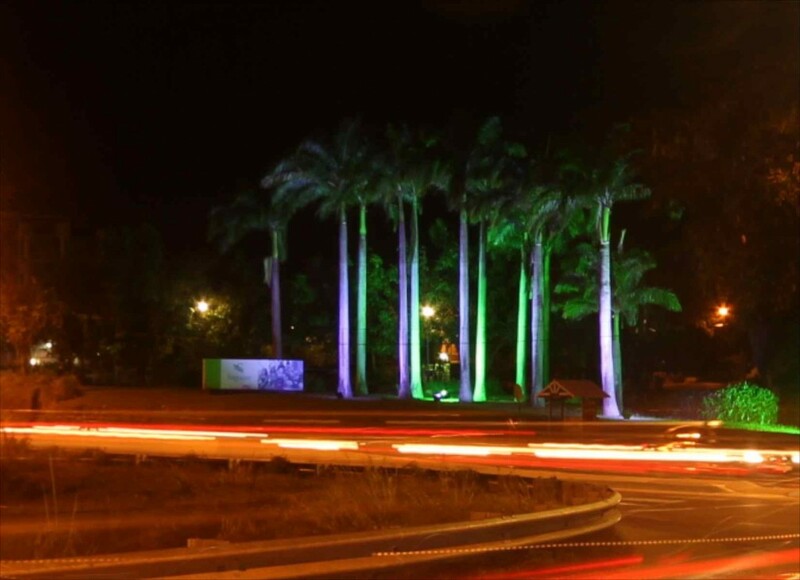 Each roundabout in Barbados is named after an important historical figure in Barbados and each is sponsored by a Barbados company. In our commercial world, is it any wonder that Barbadians generally refer to the roundabouts by the sponsors' names? The Gary Sobers Roundabout, aka the Sagicor roundabout. Sir Gary is another Barbados hero, a cricket legend. 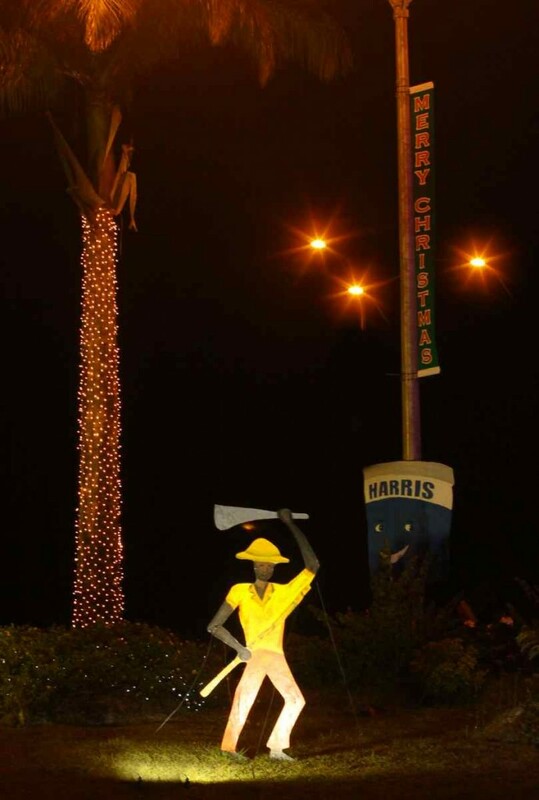 Designed to organize and slow the flow of traffic, Barbados roundabouts pay tribute to all major holidays in Barbados: Independence Day, Crop Over, and, of course, Christmas. Round & round we go …. merry Christmas from Barbados! Thanks for stopping by! Merry Christmas from paradise! Coffee Italia is way far better than Starbucks. We don’t need international brands here; we can make our own coffee and sandwiches – which is why we didn’t need that expensive sandwich shop that opened recently! Merry Christmas; the roundabouts do look good. I miss those. The street corners in Miami are just not as nice. I live in a medium sized city in New England that came to be mainly because of the industrial revolution in the late 1800’s.The homes in my neighborhood are a mix of early colonials and big stately victorian mansions with fancy brick or granite,spiral stair cases,and inlaid hardwood floors.The rich yankees who built these homes spared no expense and came to Lowell from Boston to make money in the textile industry.During Christmas,most of these homes look majestic.Many have muliple candles in the windows,wreaths and huge spotlights. Because many of these homes are expensive to heat,home owners have converted away from oil and gas heat to modern wood furnances.The wood aroma on a cold night is a delight to anyone so inclined.The smell of burning wood for me means warmth and comfort.The days during Christmas in New England are short and cold.They really encourage people to get inside and get close.Our conditions force us to at least attempt intimacy.So yes Jane,I do love it around here on Christmas and do love how Barbados looks at Christmas.If I were you,I’d grab a drink with my i-pod stand and head out to the beach and listen to a little Vince Guiraldi on Christmas Eve.I’ll be doing just that in front of my fireplace.Thank you for all that you post Jane,all the best to Greg and your family. Wow, Rod, did you bring back memories for me! I lived two years of my childhood in New England and I remember so well all you describe. When outdoors, I loved the woody smells from the fireplaces so much .. I had forgotten that until I read your words. And the pine trees, too … ! Such aromas from New England Christmases! I think you offer a first-rate suggestion … I’m going to the beach tomorrow; I’ll remember to take my ipod, Vince loaded — as well as my dear husband. Thanks for your good wishes, Rod; same to you! Merry Christmas! Haha! Miami probably has its own traditions to celebrate Christmas, though … I’ve only been to Miami a couple of times at Christmastime; what I remember is the shopppppppppppping! Merry Christmas … hope you get to do some scuba-diving! Stephen, good evening. In this blog, I have learned so much about where to get great coffee in Barbados! I agree with you that Coffee Italia beats Starbucks. Great photos! I love seeing the Christmas spirit show strong in a place where snow is replaced by beautiful sand.